Lately, the people who reside in our home have been a little lax when it comes to taking care of their property and making sure things are returned to their spot. These people include everyone buy myself. After all, I found places for everything, I know where everything goes. Part of the problem is no one is willing to actually LOOK for their stuff. 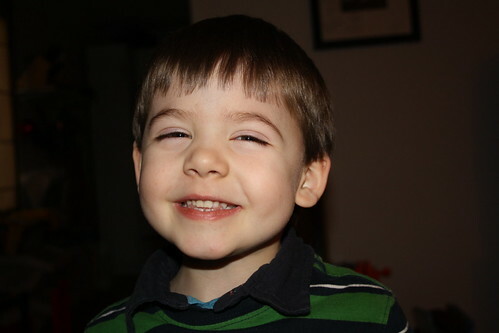 They more glance around and if it isn't within immediate view, I hear "Mommy! I can't find..." or "Marina, do you know where....?" Many may automatically assume that because over the last 10 months I have reorganized the house in to chaos. What good is an organized house if no one knows where the stuff is? Well, I covered that. Everything is either labeled, alphabetized, or, as is the case for the filing cabinet, it comes with list of things that are in there and where to find it. I've covered all the bases to make this household flow as easily as possible. Plus, things don't go missing until they have been taken away from their homes anyway. Earlier today, my Little Man had been playing with his new favourite toys. Their names are as follows: Turtle, the turtle. Hammy, the hamster. Woof, the dog. Rhino, the rhino. And Bob, the horse. I don't know why the horse gets a name, or why he chose Bob. I don't ask these questions because they usually come with long winded answers that are so long he forgets what the question was. Little Man carries them all over the house. Problem is, he sometimes forgets where he left them and then asks me for help. After a week of hearing people ask me where stuff was, I was a bit irritable. 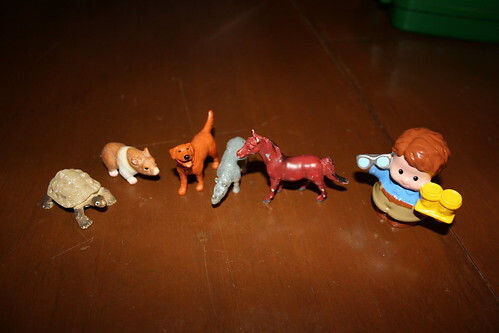 So when Little Man told me he couldn't find his animals I told him he should look for them. "But Mommy, there is a big mess on the floor!" "Well, if you clean it up then you"ll find them." "But Mommy, they are small animals, it is going to take FOREVER!" "Mister Man, if you can make a mess, you can clean it up." "But Mommy! I'm just a little boy! See, I'm only this tall! And my hands are very small!" 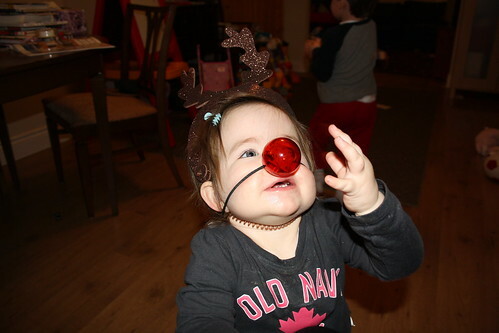 That's my Little Lady, dressed up like Rudolph and trying to catch the blinking light from the nose. And then I'm laughing so hard that I have to sit down because my monkeys are being monkeys. And then while I'm sitting there I absent mindedly start tossing toys in to bins. 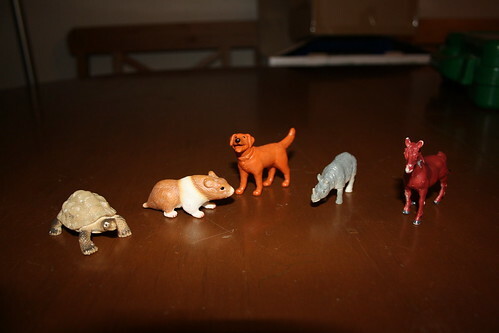 And then I come across Little Man's animals. And I've been fooled. They tag teamed me. I'm totally out numbered. So just to keep things even, I give them each a swiffer and wet cloth and tell them to clean the floors. Only difference is, they think cleaning the floors is fun. Sneaky little buggers they are. Just think what they can get me to do when I'm old and senile. I know, it has been a long time! The kids have me busy cleaning up their mess! Demoralizing is a very good way to put it, LOL. This picture of Anna makes me laugh every. single. time. It's totally hilarious. I love it. And the last word I had to type to verify that I was a real person to comment on your blog was "fingery". That's just weird.